Are you in a burger rut? Need a new taste to knock you out of your comfort zone? Stopping by the brand new Shalom Catering in the Philly ‘burbs will do the trick (just don’t stop by on Friday night!). The burger is akin to a middle eastern kafta kebab in taste and texture, but make no mistake, this is a real burger lovers burger, served on a perfectly squishy seeded bun with lettuce and tomato (and wrapped in that essential burger blanket – wax paper). The burgers are cooked fresh and to order (mine was medium, would probably order medium-rare next time) and comes with a side of coleslaw that I kept thinking would taste really good on a pulled pork BBQ sandwich (just not here!!). Shalom Catering’s sister restaurant Shalom Pizza has been serving amazing falafel and pizza for years and a meat restaurant is the perfect compliment. 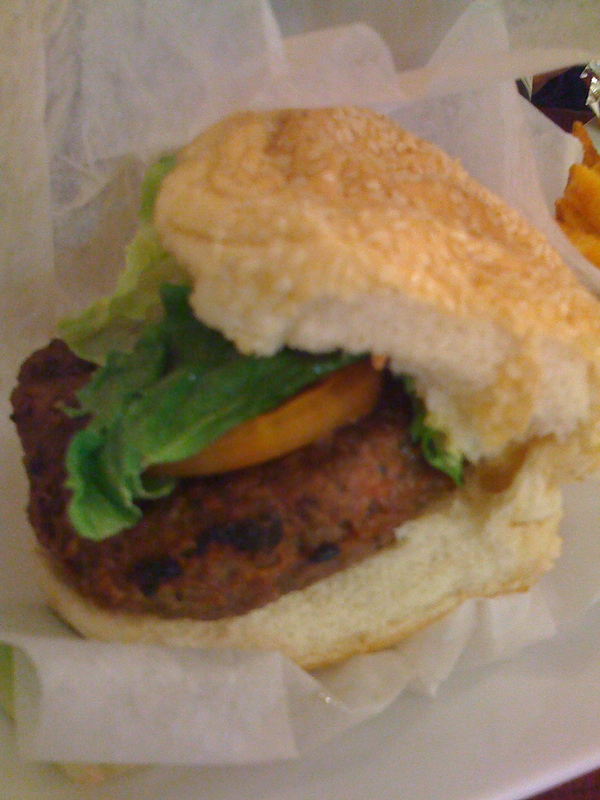 (Meat and milk don’t mix, so don’t even ask about a cheeseburger) Even if you are not Kosher (I’m not) or Jewish both restaurants are welcoming and deliver quality products that defy the typical kosher=bland stereotypes (and that could just be myhang-up from a particularly scarring vacation one summer in the Catskills). At some point I need to institute a rating system for this site, as this place is deserved of at least a 3 1/2 out of 4 stars. This looks so delicious! Must try one day when I get a chance. I am a burger lover… must visit the place one of these days. More power! Good luck with the business. Thanks!